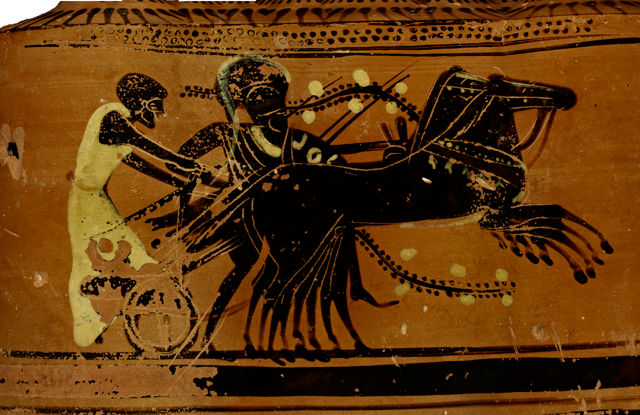 A warrior leaps out of a chariot pulled by four galloping horses. He lands, sprints after the chariot, and jumps back onto the speeding vehicle. This spectacle appears on an oil flask in the collection of the Cantor Arts Center. It illustrates an equestrian event called the apobates, part of the Panathenaic Games, which were held every four years in honor of the goddess Athena. Attic black-figure oil flask (lekythos) from Greece, dated 480 BC. This lekythos is decorated in the technique of Athenian black-figure, which was invented in Corinth in the 7th century and appropriated by the Athenians in the 6th century. The object, along with over 100 similar flasks depicting the same scene, is attributed to the Haemon workshop. 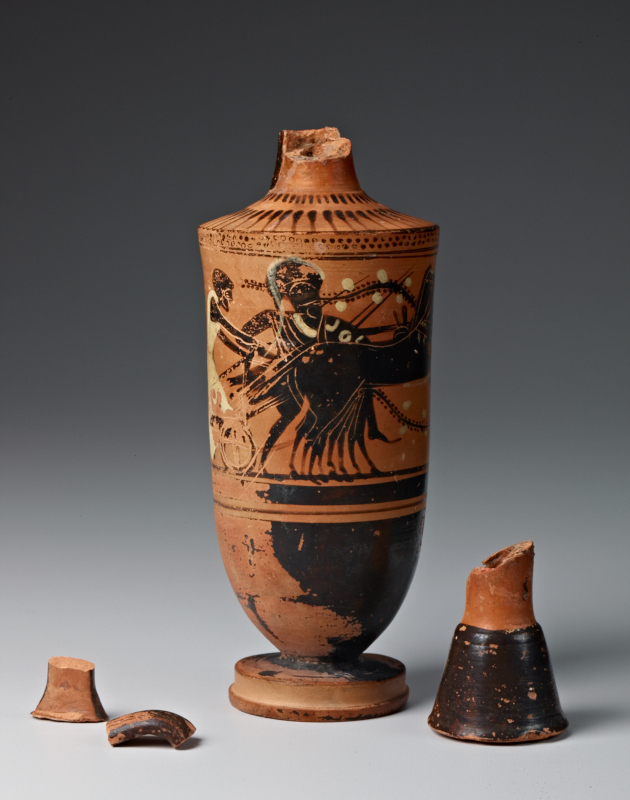 These flasks, filled with olive oil from Athena’s groves, may have been sold at the Panathenaic Games. Firing black figures onto a red background is a challenging task, and difficult to replicate even today. How did they do it? The most popular theory is that the starting material for the black figures is the same clay as the pot itself (for an excellent in-depth discussion, see Joseph V. Noble, The Techniques of Painted Attic Pottery, 2nd edition, London: Thames and Hudson, 1988). By mixing the pot clay with water, the artists made a thinner clay called a slip. This slip could then be painted on the pot, making the figures. Both the red and black colors result from the iron abundant in Attic clay. Depending on the oxidation state of the iron atoms in the clay, the pot will look either red (hematite) or black (magnetite). Getting black on top of red would have taken three steps. First, when heated in the presence of oxygen, iron oxidizes to a red color, similar to how steel turns a rusty red. If you continue to heat oxidized iron and remove oxygen, however, the iron reduces, turning from red to black – the second step. During this step, the whole pot would have turned black. Here’s the key part of the theory. During the second step, in the slip layer, the clay particles sintered, or fused together, becoming oxygen-impermeable. This process is illustrated above. In the rest of the pot, sintering did not occur at these high temperatures. Why just in the slip? One hypothesis is that the artists mixed the slip with zinc-rich vitriol, removing carbonate from the clay and thereby encouraging the sintering process. Finally, in the third step, the potters added oxygen back into the mix, turning the non-sintered parts of the pot from black back to red. The fused parts of the pot remained black. So was it really a zinc additive that helped sintering? How did they make the white layer? What was the process for decorating these pots, which might have been produced by the thousands? A custom mount made by Cantor Arts Center preparator Holly Gore secures the flask during a rotational XRF scan, helping to minimize stress on the object. 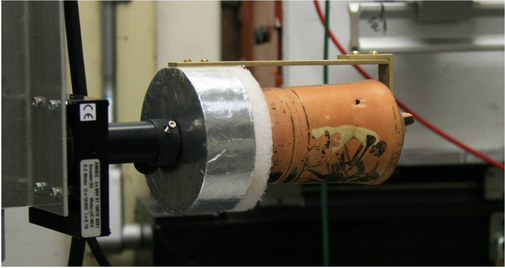 To better understand the process, we petitioned for permission to transport our vase to the Stanford Synchrotron Radiation Light Source (SSRL). There we took a close, quantitative look at the elements present on the surface of the pot using a non-invasive technique called synchrotron X-ray fluorescence (XRF). This technique shoots high energy photons (X-rays) at the pot, which absorbs the photons and then re-emits them at different energies (fluorescence). Different elements fluoresce at different colors, giving a fingerprint of the elements in the sample. Chemical map of pot surface. Red= iron, green = calcium, blue = potassium. Here’s a map generated using XRF. Comparing this map to the photograph of the pot below, you can see that the calcium-rich parts of the pot match very well with the white regions, while the black parts are both iron-rich and potassium-rich. Rolled-out photograph of the pot surface. Potassium (blue in the map), matches well with the iron except for in a few spots on the horse’s hindquarters and in its halter. 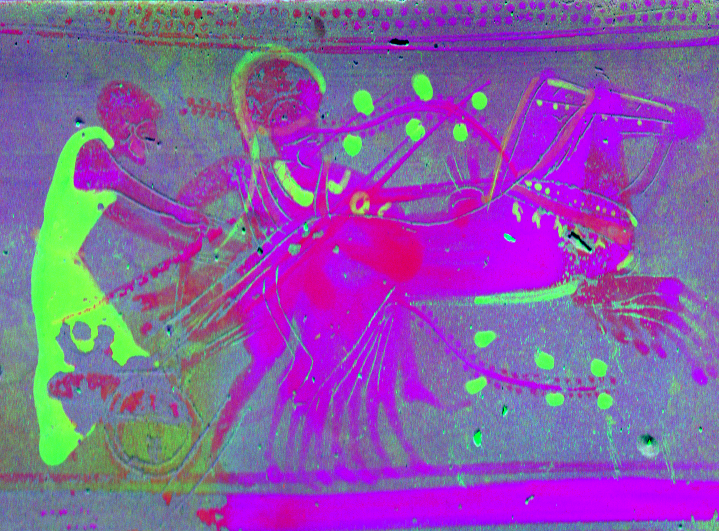 This effect might arise from different layers of slip in those regions, for example if the horse was painted over a previously-fired image (such as a shield). Performing XRF on a cross-section of the sample rather than just on the surface could give a clue to the order in which different slips were applied. Doing this type of cross-section microscopy showed us that white regions are made from a calcium-rich layer painted on top of a black, iron-rich layer. Another chemical map of pot surface, this time showing zinc instead of potassium. Red = iron, green = calcium, blue = zinc. What about the role of zinc? This second map shows the distribution of zinc in blue. You can see that most of the black regions do not have a lot of zinc, giving reason to reexamine the idea that a zinc-based additive increased sintering in the black region. By scanning an entire piece alongside sampling of individual shards, we can better understand of the object as a whole and the process likely used to make it. 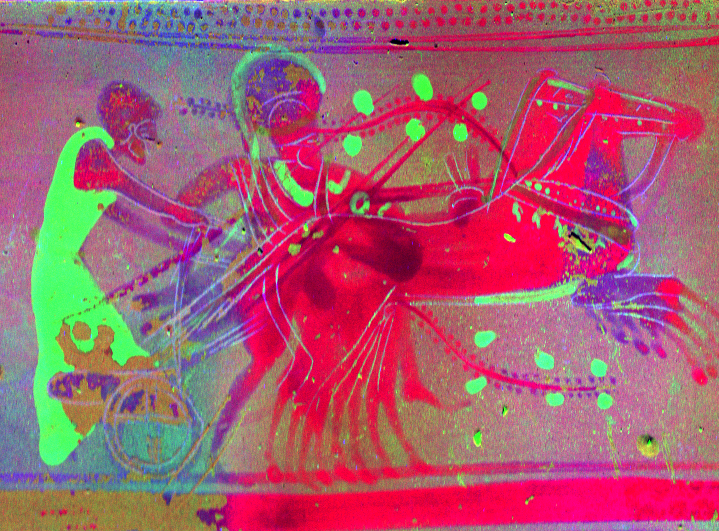 The XRF scans revealed that the ancient Greeks used a Ca-based color additive to slip for white coloration. This would have added another step to the process used in the workshop. From our study, we’ve learned that even a common souvenir pot still likely underwent an elaborate, multi-step mode of production, decoration, and post-firing incisions and refinements. This project was conducted with Susan Roberts-Manganelli, (Cantor Art+Science Lab) Apurva Mehta (SSRL), and Jody Maxmin (Art History/Classics, Stanford). Special thanks to Marc Walton (Getty Conservation Institute), Holly Gore (Cantor), Sam Webb (SSRL) and Ben Kocar (SSRL). This investigation was made possible through a grant from the Stanford Office of Undergraduate Advising and Research. The work was performed as my undergraduate research project and represents a collaboration between the Iris and B. Gerald Cantor Center for the Visual Arts, the Stanford Synchrotron Radiation Lightsource (SSRL) at SLAC National Accelerator Laboratory, and the Getty Conservation Institute (GCI).